Men who are being tested for prostate cancer may be spared the need for invasive biopsies in the future. 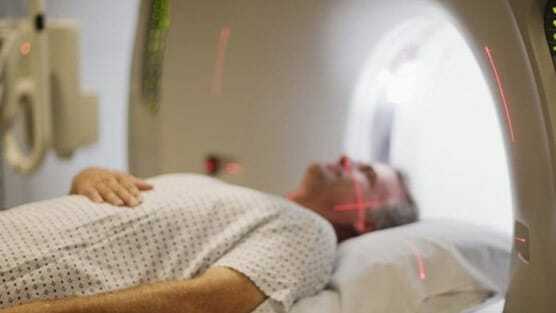 Researchers unveiled the latest findings published in the medical journal The Lancet showing that a multi-parametric MRI can pick up 93% of aggressive prostate cancer compared with only 48% when done with a biopsy. Typically, diagnosing solid cancer tumors will use imaging such as an MRI to identify if a patient needs a biopsy. Prostate cancer is different in that men who are found to have an elevated serum prostate specific antigen (PSA) will be offered a transrectal ultrasound-guided biopsy (TRUS) rather than using an imaging tool. The biopsy is considered invasive as it uses twelve needles to take samples from various points on the prostate gland. Each year more than 100,000 men undergo this procedure and it has the potential to lead to side effects of bleeding, pain, infection, and possible erectile dysfunction. For some men, they can also suffer a life-threatening bloodstream infection called sepsis as a result of the standard TRUS-biopsy. This new research recruited 576 men between 2012 and 2015 of whom all underwent both an MRI and TRUS-biopsy or TPM-biopsy (template prostate mapping biopsy). On TPM-biopsy, 408 of the 576 men had cancer with 230 of 576 patients who were clinically significant. For clinically significant cancer, the MRI imaging was more sensitive (93%) than TRUS-biopsy (48%). The study also showed that more than a quarter (27%) of all men with suspected cancer could avoid a biopsy altogether. Some hospitals already offering a multi-parametric MRI before doing an biopsy but the number of healthcare facilities using them is limited at this time. Many different kinds of cancer are diagnosed with the use of MRI’s making them in high demand for various cancers with a need for specialized training of radiologists to interpret the scans.